Did you know that California is the state with the most stolen vehicles? To help address this problem, the Automobile Club of Southern California and local law enforcement will provide free anti-car theft Vehicle Identification Number (VIN) etching for car windows on Wednesday, April 24 from 10 a.m. to 3 p.m. at the LAPD-Hollenbeck Division, 2111 E. 1st St., Los Angeles. Car window VIN etchings are small, but visible enough to deter thieves, according to law enforcement officials. The Auto Club is co-hosting the event with the LAPD-Hollenbeck Division and the National Insurance Crime Bureau (NICB). The agencies also will offer theft prevention tips to car owners. The FBI Uniform Crime Report noted 4,354 car thefts in Los Angeles County in 2016. The LAPD-Hollenbeck Division noted that on average 82 vehicles are reported stolen each month in its jurisdiction. 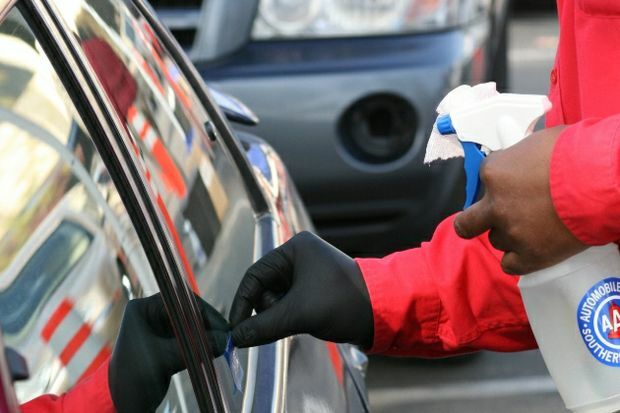 Drivers with current vehicle registrations and driver licenses can receive the VIN etching on their vehicles’ windows to make them less of a target. For more information, call Auto Club Public Relations at 714-885-2324 or LAPD Hollenbeck Division at 323-342-4100. Car theft is the number one property crime in America. Law-enforcement officials say the permanent engraving of a vehicle’s federally registered VIN etching helps deter car theft, because VIN-etched car parts cannot be sold as easily by thieves. Always lock your vehicle with the windows closed. Never leave valuables inside the car, especially not in clear view, including cash, gift cards, sunglasses, spare keys, small electronics and chargers, purses or wallets, checkbooks, garage door openers, personal paperwork, vehicle ownership title, credit cards, ATM cards or any personal identification. Never leave your keys in your vehicle, even at a gas station, a locked garage, or in hide-a-key boxes. If you own a frequently stolen vehicle, like an older Honda or Toyota, get a secondary locking device for your vehicle and use it. Use a valet key when valet parking. Some vehicles have special valet keys which can only be used to park your vehicle. Several high-performance vehicles also use special keys to limit vehicle speed and engine revolutions per minute (RPM). Never leave your parking ticket stub in your vehicle. Take it with you so an auto thief cannot use it as a "ticket" to exit out of the parking lot or structure. If you must leave your keys with a valet, always remove all other unnecessary keys. While you’re enjoying the show or dining out, a dishonest valet can copy your keys and later burglarize your home or business. Beware of thieves stealing vehicles during test drives. If you’re advertising a vehicle for sale online or on Craigslist, get driver’s license information of the prospective buyer and enough other information to ensure the potential buyer will have a strong incentive to bring the car back. There is no guarantee that your car will not be stolen but taking precautionary measures can minimize your chances of becoming the victim of auto theft.